Hello Toronto - Chocolate Tales - Entertainment You Can Taste! Our classic chocolate making workshop is ideal for excited beginners and any chocolate lover wanting a hands- on introduction into the world of chocolate making! 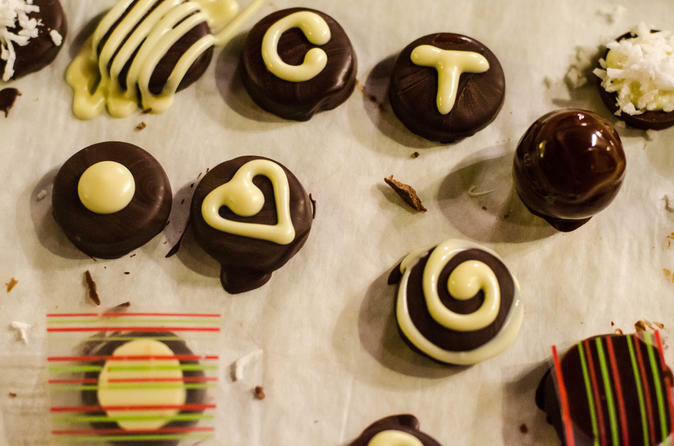 We share with you the unique history of chocolate and chocolate making and pass the tradition onto you by teaching you how to make your own gourmet chocolate treats... roll up your sleeves, it’s time to get crafty! Discover & Learn the secret of Truffle Making! Come and enjoy our chocolate truffle- making workshop and become a truffle master! Suitable for anyone, this class will share with you the techniques, tips and tricks of chocolate truffle making including how to personalize your own creations for any occasion! This brilliant class will also teach you how to work with different types of chocolates and other delicious ingredients. Take away 20+ of your very own homemade truffles! Join us for some hands - on truffle making fun! For the chocolate lover that demands more to excite their taste buds, come experience our Savory and Sweet Chocolate Making Workshop! Challenge mainstream chocolate by pairing it along with exotic flavors such as Himalayan pink salt, ginger, olive oil and balsamic vinegar while you create tasty fillings to pipe into your own truffles! Take away your chocolate creations in a gift box! Follow in the footsteps of Milton Hershey and discover how to incorporate caramel into chocolate by crafting various confections.